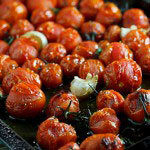 To make the roasted tomatoes, pre-heat the oven to 220°c and place the tomatoes in a roasting tray and add the garlic. Drizzle with the olive oil and season with the salt & pepper. Place in the oven for 25-30 minutes until the tomatoes are blistered and starting to burst open. To make the breadcrumbs, toss the breadcrumbs with the olive oil, oregano and salt and spread onto a roasting tray. Allow to brown in the hot oven for 5-7 minutes. Remove and set aside. To make the sauce, chop the bacon into bite size pieces and fry in a large pot until golden brown. Remove from the pan and fry the onion and chilli until soft and translucent. Add the roasted tomatoes (and garlic) and bacon back to the pot. When the pasta is cooked, reserve 1 cup of the cooking liquid and toss the drained pasta with the sauce, add the basil and some of the cooking liquid and allow to sit for a minute so the pasta can absorb all the sauce. Serve the pasta with a generous handful of breadcrumbs and a few fresh basil leaves.